IAEA Director General Mohammed El Baradei was scheduled to arrive this week in Iran to discuss safeguards issues, visit these sites, and meet with Iranian President Ali Mohammad Khatami. However, the Iranian government canceled his delegation’s visit. In late November 2002, El Baradei told Newsday that he hoped to visit Iranian sites that may be a part of efforts to acquire a complete nuclear fuel cycle. El Baradei’s visit had been postponed before. The visit is currently expected to occur in February 2003. The existence of this site increases suspicions that Iran may be building a heavy-water moderated reactor. ISIS has been unable so far to locate such a reactor, completed or under construction. The power reactor under construction at Bushehr does not use heavy water. Iran’s existing research reactors do not use heavy water or too little heavy water to justify a heavy water production facility. 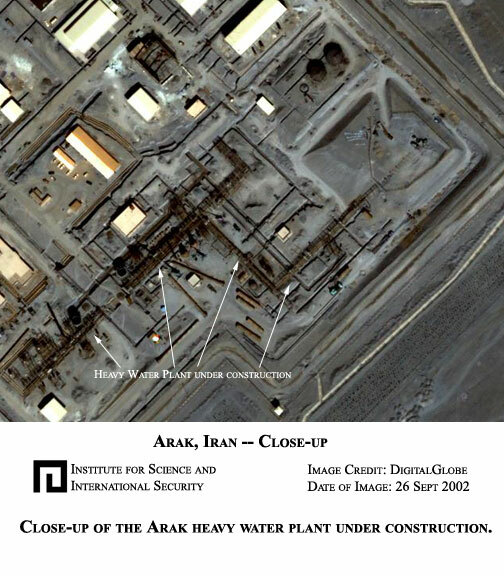 Iran stated at the IAEA General Conference in September 2002 in Vienna that it was pursuing a “long term plan” to construct “nuclear power plants and the associated technologies such as fuel cycle” facilities. A few years ago, a senior Iranian official told ISIS that Iran was pursuing a complete fuel cycle. There is concern that this effort to obtain a complete fuel cycle is aimed at developing the capability to make separated plutonium and highly enriched uranium, the two main nuclear explosive materials. Evidence that Iran is acquiring fuel cycle technology without IAEA supervision increases suspicions about Iran’s activities. At a minimum, Iran needs to open these sites to IAEA inspectors and be fully transparent about their purpose. By their very nature, these types of facilities are dual-use. They can be built as civil facilities and can be relatively quickly converted to produce material aimed at making nuclear weapons. Alternatively, they can be copied and build clandestinely. Under the NPT, Iran has a traditional safeguards agreement in place. Iran has not accepted the IAEA Model Additional Protocol, which was developed in the 1990s and significantly strengthens safeguards and the IAEA’s ability to detect undeclared nuclear activities. These photos were purchased as part of a longer term ISIS project aimed at assessing Iran’s nuclear infrastructure and finding ways to increase transparency of Iranian nuclear activities.